1. Make 2 red & 2 green tie bows out of the ribbon. 3. 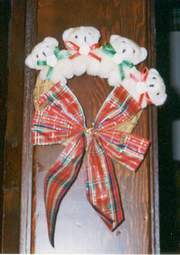 Tie the plaid bow to the bottom of the wreath. glue to the back of the wreath for a hanger. Thats it! Very easy & cute!